Indoor-outdoor kitchens are more popular than ever, and perhaps that’s no surprise. After all, by linking your kitchen to your garden with fully glazed doors, you can create an exterior space that can be appreciated and easily accessed all year round. The success of an indoor-outdoor kitchen comes down to how well you can make the garden a natural extension of your living space. These design tips from our panel of experts will get you started. Patio doors opening on to the garden make sure this kitchen-diner is flooded with natural light. An average sized kitchen from British Standard Cupboards costs around £7,000. 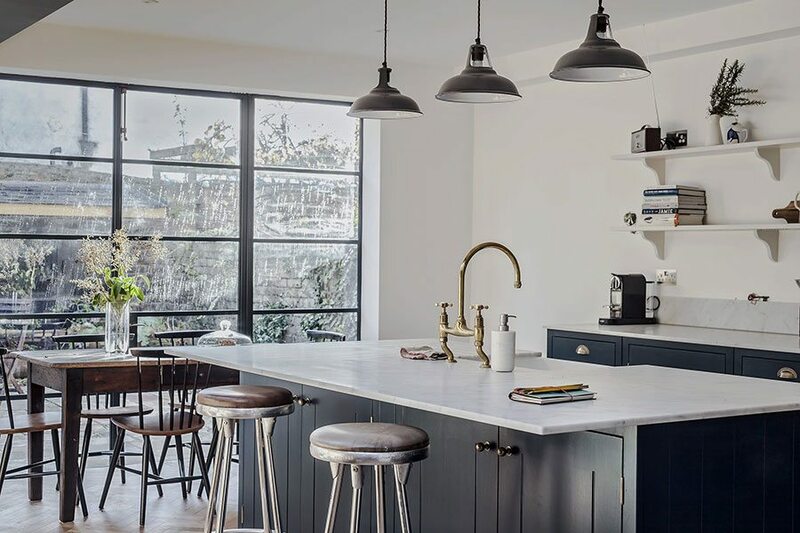 Start by reflecting on what you most use the space for, and focus on this in your planning, advises Graeme Smith, senior designer at BioGraphy and 1909 Kitchens. If there is space, maximise the view of the garden by adding a living room area. “This is free from the practical goings on in the kitchen, away from the preparation and cooking – so an area to relax, sit back uninterrupted and take in the surroundings,” explains Graeme. Many indoor-outdoor kitchens include a hob or sink incorporated into a central island unit. Set it at 90 degrees to the view so that the chef can enjoy it while cooking. You could also consider turning one end of an island unit into an informal dining area so you can take in the garden while eating. 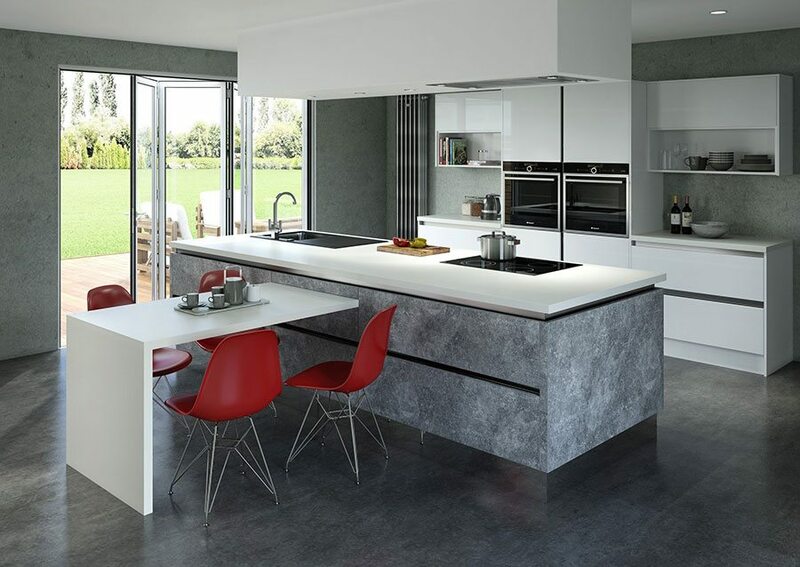 Bring the outdoors in with Lunar, a concrete-style kitchen paired with Furore super gloss white for a contemporary feel. Crown Imperial kitchens start from around £10,000. Comprising a series of glass doors with an aluminium, PVC or wooden frame, bi-fold doors fold on top of one another to give a completely unrestricted and seamless connection between the inside and out. “How many doors you need will depend on the size of your opening and the layout of your home, but it is best to always think in odd numbers, so doors can fold in the same direction,” says Neil Ginger, CEO at Origin. Larger individual glass panels allow more light into your home. “Opting for fewer door panels will also keep costs down due to the majority of material costs coming from the door profiles,” adds Neil. Consider including a traffic door in the set-up. This works much like a normal back door and allows quick access to the garden without the whole bi-fold system needing to be opened. Expect to spend £1,150 per panel.for these bi-folding doors in anthracite grey by Express Bi-Folding Doors. Sliding doors feature glass panels that slide to one side of a large door opening and stack one in front of the other. 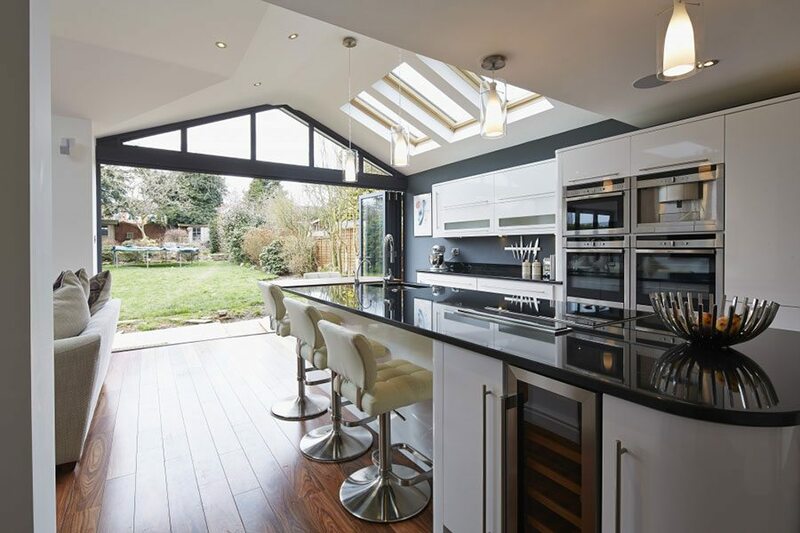 They do not create as much of a clear opening as bi-fold doors, but their frames are generally slimmer and therefore less obtrusive when the doors are closed. If you want sliding doors with an unrestricted view, the best solution is pocket doors that slide back and slot into a space built into the wall. These must be planned for as early as possible in order to create the necessary space. The amount of wall space you need depends on how many sliding panels you want. 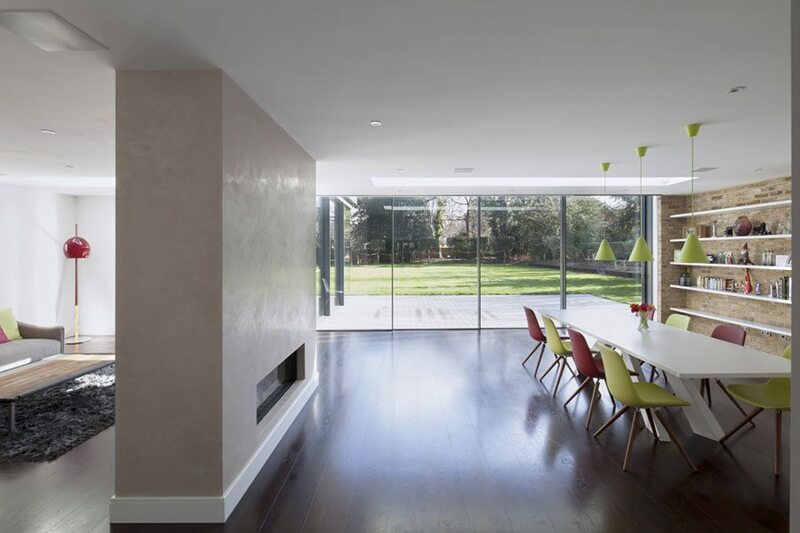 “A slim framed sliding door with double glazed units has a depth of 60mm per sliding track. If you have two panels sliding into a pocket, you will need 120mm of space within the wall. Three panels require 180mm, and so on,” explains Rebecca Clayton of IQ Glass. When choosing a pocket door system, ensure it has a pre-designed system for blocking or weather sealing the pocket when all the doors are closed. 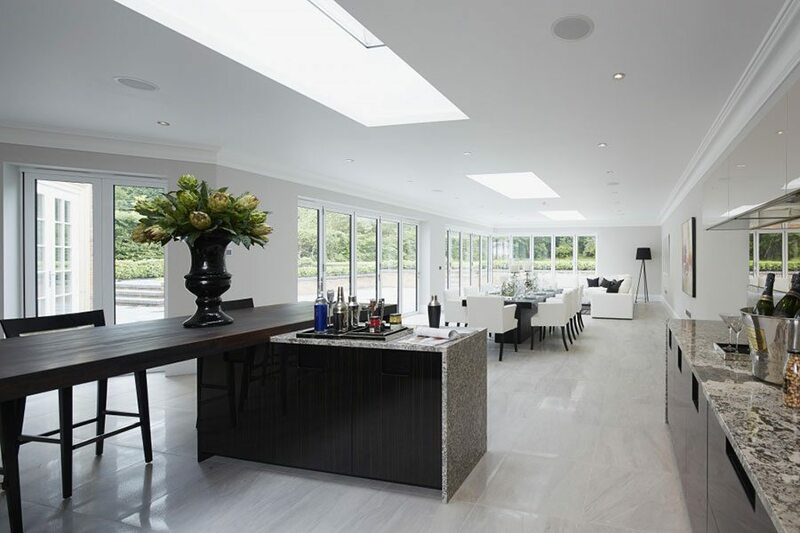 Sliding glass doors from IQ Glass are priced around £1,000 per sq m, as shown. Whatever kind of door you go for, if you want a flush threshold (that is, no step between your two spaces) you’ll need to recess the door tracks. Think carefully about drainage: with no step, you’ll need a means of channelling water away from the house. These homeowners chose XP Glide sliding doors and XP10 bi-folding doors by Express Bi-Folding Doors. A similar set-up would cost around £5,000. How do the costs compare? uPVC frames are usually the cheapest option, but the frames tend to be wider to compensate for the material being weaker. “This can affect how many door panels are needed, which in turn, means less glass and consequently, less light,” explains Neil. uPVC frames also have a tendency to flex and warp in differing weather conditions, which can limit their operation and reduce their longevity. Timber doors can look great in certain types of property and offer a warm feel. “Like uPVC, they tend to have wide sightlines, which can restrict your view. Regular maintenance is also required to keep timber looking good and working well, especially when the doors are in direct sunlight,” Neil continues. Aluminium is arguably the best choice for doors, as it offers a combination of strength and weight, allowing for narrow, more aesthetically pleasing frames and better sightlines. They are extremely low maintenance and tend to come with longer guarantees, as they are resilient to flexing, expanding and contracting. The strength of the aluminium used for Origin bi-folding doors means that the frames are extremely narrow, allowing for an expansive view and plenty of light. The beauty of aluminium frames is that you can personalise them in a colour – or even colours – of your choosing. “The interior and exterior door frames can be different colours; so whilst the outside of the doors can match the external fixtures and fittings of the house, the interior frame can be a different colour to match the room,” suggests Neil. Realistic wood-grain effects are also available, offering the aesthetic beauty of wood with the superior performance of aluminium. “If your property is within 5 miles of the coast, the finish to the frames will need to be marine grade, which is at least 60 to 80 microns thick,” advises Rebecca. These bi-folding door in anthracite grey by Express Bi-Folding Doors are priced around £1,150 per panel. If you choose to run the same flooring inside and out to create a sense of continuity, you’ll need a product that can be used in both environments. Remember: outdoor flooring will need to withstand a range of weather conditions, so it should be frost- and waterproof. Always check that the tiles you’ve chosen offer slip resistance (expressed as R ratings), too. Outdoor tiles may also be thicker than inside flooring. Make sure that your tiler can handle this: “An experienced tiler will be able to compensate for any discrepancies in the tile depths by preparing the substrate and adhesive bed accordingly and, if necessary, by using threshold or reducer strips,” says Caroline Gow, senior tile manager at Fired Earth. Cement-effect porcelain Barbican tiles from Fired Earth. 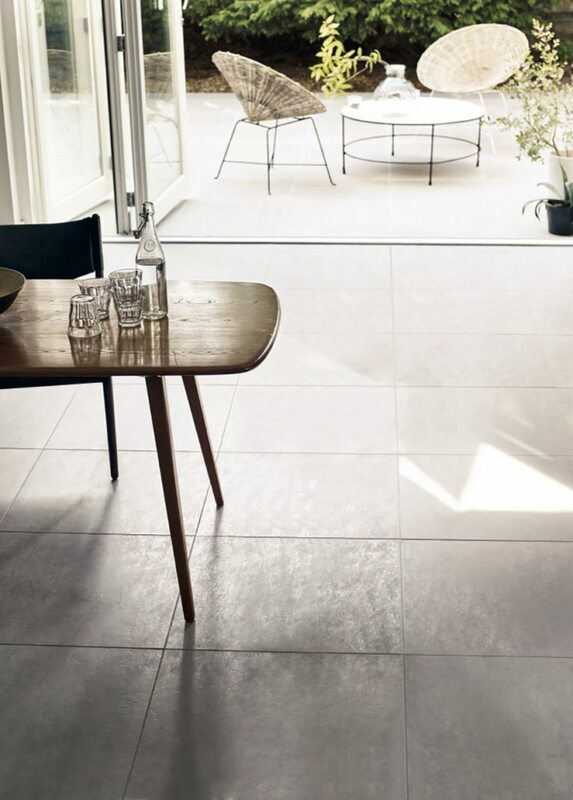 Used indoors, the tiles cost £69.80 per sq m, while the thicker outdoor tiles cost £79.94 per sq m.
Glazed porcelain tiles are high-fired and virtually non-porous, so they’re a fantastic choice for the great outdoors. They’re low maintenance and resistant to stains from splashes and spills in the kitchen – a bonus if it tends to be busy. Performance aside, porcelain tiles come in an array of styles and designs, so you can choose from remarkably realistic-looking replica wood and stone tiles for a natural effect, or go for eye-catching patterned tiles. Perhaps surprisingly, given their origins, stone tiles are often unsuitable for outdoor use. “Water can permeate their natural cracks and fissures, causing frost damage,” explains Caroline. However, if you have your heart set on stone, staff at a reputable retailer will be able to advise which tiles are suitable for outdoor use. Fans of a more contemporary surface should look into low maintenance Dekton by Cosentino. A composite designed for both inside and outside use, Dekton is resistant to UV fading and ice, and will repel stains thanks to its low porosity. If you’re using wood on your kitchen floor, running interior flooring planks perpendicular to the doors will naturally draw the eye to the garden. Remember that if you continue wood outside with decking, it will fade if it’s not treated regularly. 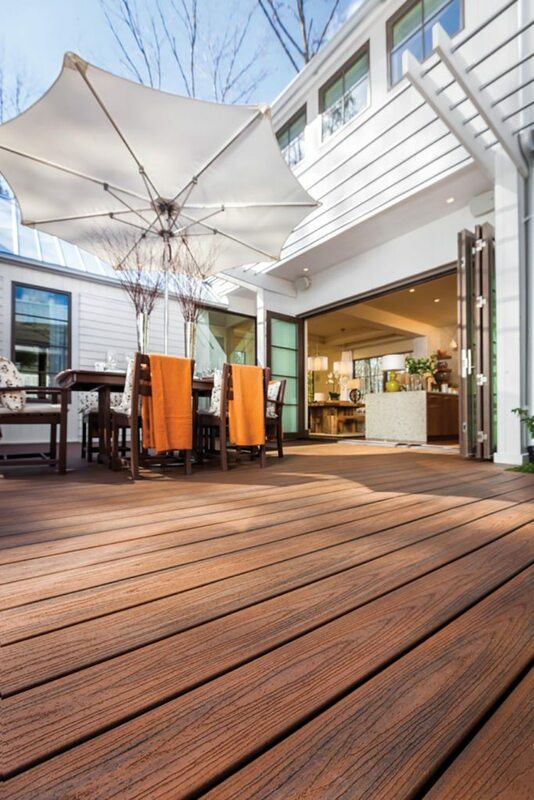 Trex is made out of 95% recycled materials and, unlike traditional wooden decking, won’t rot, warp, crack or splinter. Seen here is Trex Transcend decking in Tiki Torch, priced from £75 per sq m.
In homes with large expanses of glass, it’s important to light the garden. Without exterior lighting, the glass turns into a mirror at night, creating the feeling of living in a goldfish bowl. “By adding lighting you add depth, drawing the eye outside and effectively giving yourself an additional room all year round,” explains Alexandra Fry, senior designer at John Cullen Lighting. 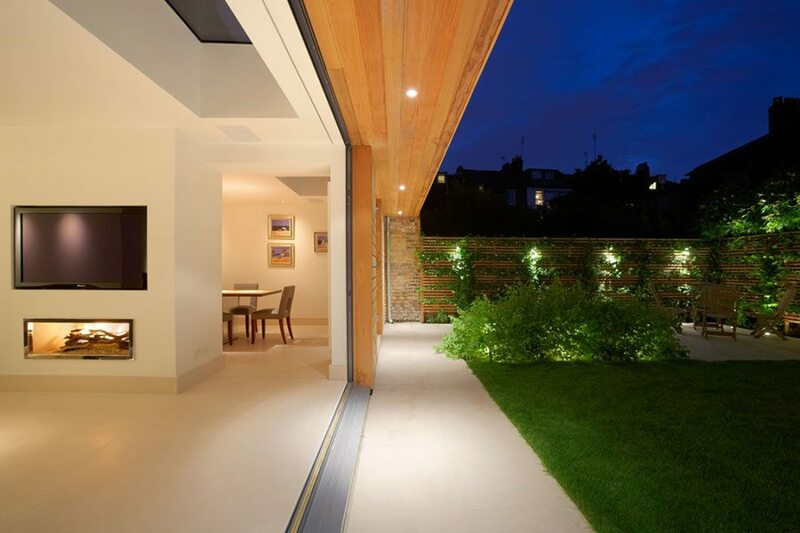 Outdoor lighting works in much the same as indoor lighting, but it can be tricky to get the right balance of light. To get the best results, use a lighting consultant. They will also find the most effective way to control the various circuits so that the scheme can provide different light levels. Spiked 1w LED fittings from John Cullen Lighting are used to make a feature of plants and trees in this garden. Costs for an indoor-outdoor lighting scheme from John Cullen Lighting start from £1,500. Focus on earthy colours and natural materials for flooring, walls and furniture to achieve a seamless fusion of indoor and outside spaces. 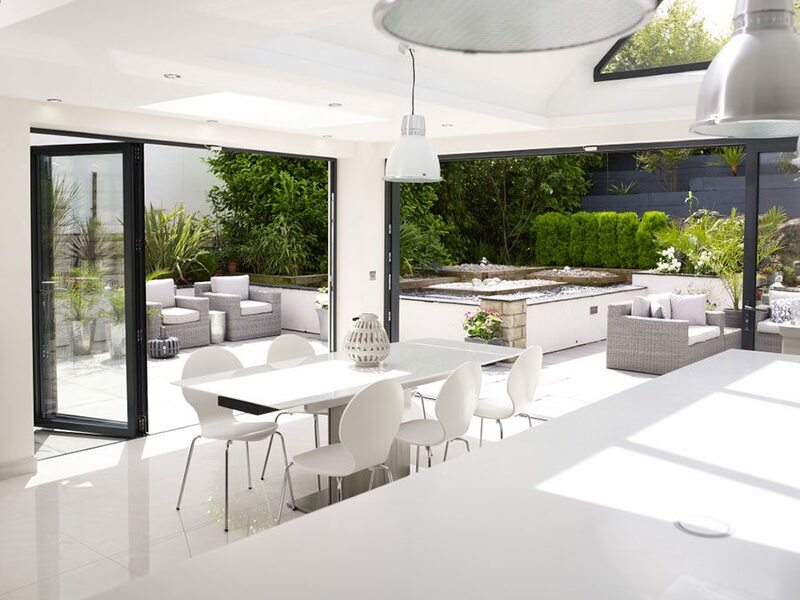 Light-reflecting surfaces such as glass splashbacks, high-gloss worktops and wall cladding will reflect the view of the garden, again, connecting the two spaces together. You can also unite your spaces by furnishing your garden with indoor-style features: add brightly coloured waterproof cushions to your sun lounger, decorate planter boxes with frost-proof tiles and invest in a stylish dining set that looks as though it has come straight out of a dining room. Similarly, invite the outdoors in with rougher textures such as exposed brickwork. If your budget won’t stretch to the real thing, fake it with wallpaper and tiles that replicate the look. 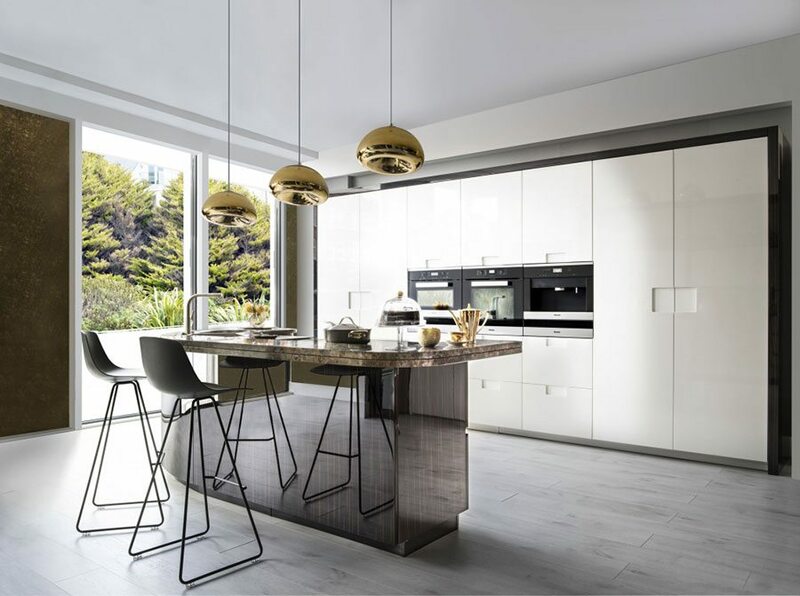 This Neatsmith kitchen features high-gloss lacquered units with integrated leather handles. The curved island features an Emperador marble worktop. Priced £49,200, as shown. Wondering how you will dress your patio doors? Click here for inspiration.